Alanda October 4, 2017 Leave a Comment This post may contain affiliate links. Scroll to the bottom of this post to watch the video tutorial. Couching is a technique where you lay yarn, thread, ribbon etc on top of you fabric and stitch them in place with a zigzag or fancy stitch, either in a similar thread or a contrasting thread. 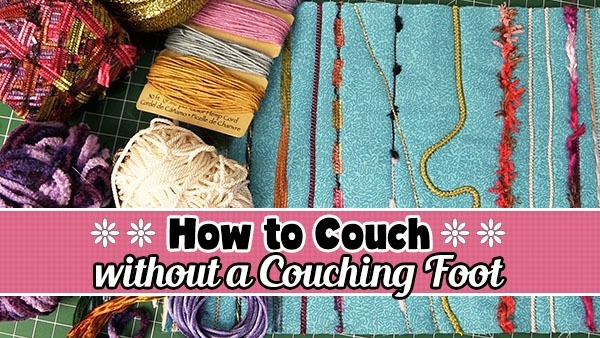 Couching adds interest and texture to your projects. I love playing around with different wools, threads, embroidery thread, lace, wool roving, and assorted cords to make my projects pop. Do You Need a Special Couching Foot? A specialized cording foot is great machine accessory if you love embellishing your fabric projects. But what if you don’t have a couching foot for your machine? Well that’s okay, you don’t need to have as special foot to do this. What Can I Couch On? 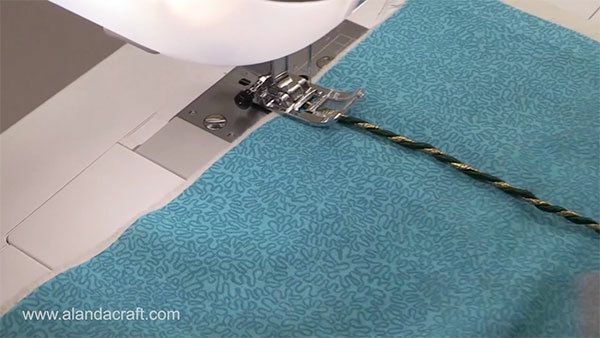 You can couch on just about any type of fabric, always do a test first to make sure your machine can handle it. 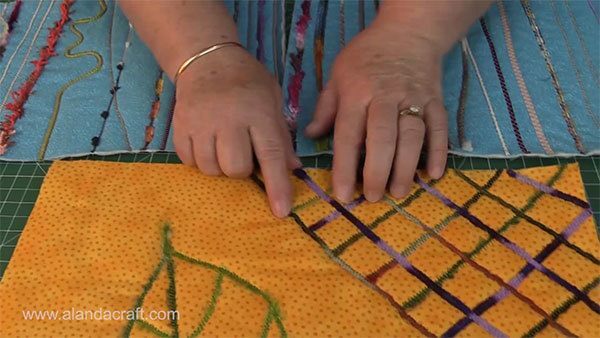 If you are using quilting or lightweight fabric you will need to add a piece of batting or some sort of stabilizer to the back, otherwise the fabric will pucker and ruin the look of your piece. If you are using denim, canvas or a heavyweight fabric you may not need to add stabilizer. But do make sure that you do a test piece to start with as you don’t want to ruin your project. You can also add the backing if you are making a quilt or bag. The couching stitches will help to keep the quilt backing into place. If you don’t want to have the couching stitches show through on the backing piece, then leave it off until you have finished couching. 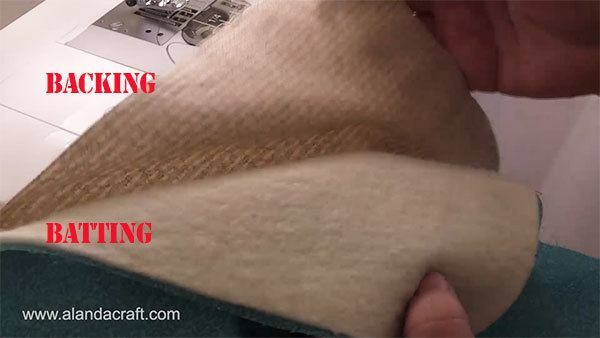 Some project’s won’t require a backing fabric but finer fabrics will always need stabilizer. 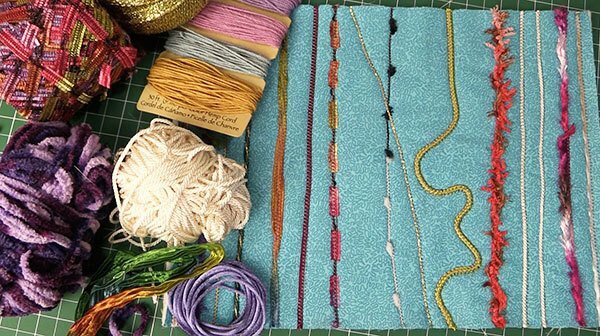 An assortment of wool, cord, wool roving, ribbon, lace and even thin strips of fabric will work. In fact you can use just about anything that your machine will handle. Make sure the wool is not too thick. Up to about an 8 ply works well. You need to be able to zigzag over the wool etc. Check your machine’s manual to make sure you have the right foot attached. It needs to be the foot that you use for zigzag stitches. 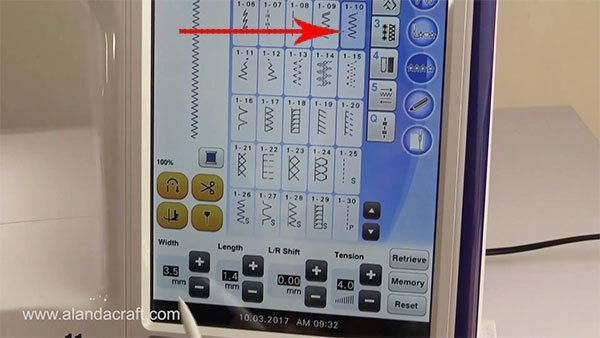 Select the zigzag stitch on your machine. Place the cord, wool etc on top of the fabric, have it extend about 2″ past the edge of the fabric. Line the cord up with the centre of the foot. Manually test the the zigzag stitch is going to go right over the cord and that the needle isn’t going to come down in the middle of the cord and split it. You can do this by turning the hand wheel on your machine. This will also ensure that your needle doesn’t hit the foot. Adjust the length of the stitch to what appeals to you. Bear in mind that you don’t want it to be too narrow as it will totally flatten the cord, and we want it to be puffed up so that it sits nicely above the fabric. Once you are happy with the stitch placement, sew down the length of the cord. You can just sew straight lines or do some gentle curves. Geometric lines look great as well. You can even draw or trace a line drawing onto the fabric and couch around it. So as you can see there are so many options to how you can add couching to make your projects look great.